Dear listener, let me tell you a tale of trials, endurance, and Magic. It took place a long time ago, when the ways of Magic were not set and things were not as they are now. In fact, it begins before there even was a Magic--but it was on its way. Before we can talk about how Arabian Nights was made, we have to talk about how I saw Magic at the time. The intent was to print Magic: The Gathering only once, and that when we started to run out of "The Gathering," we would print Magic: The Gathering—Ice Age, sort of a second Magic edition. Ice Age would have its own card back, and people would play it by itself, though mechanically they could mix it with "The Gathering." There were many reasons why I viewed the game this way rather than the way we ended making Magic. The problems associated with playtesting a game that is constantly growing are obvious--each added card has to be tested against all the previously printed cards, and so the complexity of game testing mounts. Also, being pressured to come up with new card mechanics could eventually only lead to more complex mechanics. It would be much safer to sell new environments--new combinations of mostly understood cards--than entirely new card sets. Besides, this method was closer to that employed by board and card games, a model that was better understood. So I was worried in the summer of '93, shortly before Magic was first released, when Peter Adkison told me he wanted an expansion for Magic as soon as possible. Several future versions of Magic were already in the works, including Ice Age and "Menagerie" (published as Mirage). Coming up with 100 new cards just to add to the environment was scary. They couldn't be playtested as completely, and once printed they might fragment players into factions who favored some expansions over others. After all, this differed from an expansion to a traditional board game, which you didn't play with if you didn't like. 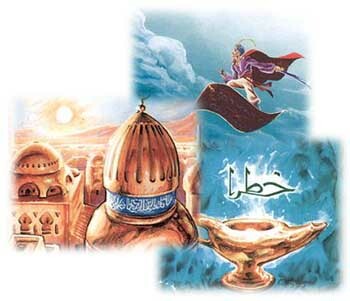 If your friend had a deck with Arabian Nights cards, did you have to accept it? The solution was to give the expansion its own card back. This way, if the players didn't want to play with or against Arabian Nights cards, they could easily moderate their environment without it looking like we were forcing extra cards into the game. They would look more "optional," like expansions for table games were. That way we could also somewhat guard against a less-playtested set hurting the overall game environment. Arabian Nights would sink or swim on its own merits rather than riding The Gathering's coattails. The problem of mixing card backs in the same deck didn't strike me as being too problematic. 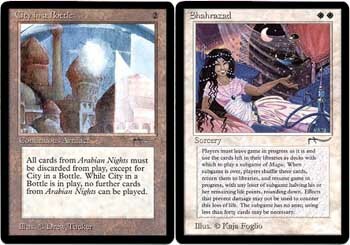 I did want to make it so that your opponent didn't necessarily know you were drawing a spell on your turn, so I wanted to have some Arabian Nights basic lands printed. This solution also allowed me to be more adventurous in creating mechanics and themes. After all, this expansion was a separate product--if it didn't work, players wouldn't play it, and we could try again with a different expansion. Because we'd be using different card backs, I felt no obligation to stick to the Magic: The Gathering mythos as it was first presented. I considered many different mythoi to explore, as well as creating a new mythos. With the time available, I felt that I would get more from using an existing mythos than I could from creating one. Besides, the Ice Age group was having a lot of fun with Norse mythology. Many felt the natural place to go was to an Asian mythos. I wanted something a bit different, however, since it felt almost cliché to start with Western generic fantasy and then go Asian for the "exotic" touch. I had always thought that the Arabian Nights mythos was fascinating--the djinni, sea serpents, thieves, heroes, deserts, oceans, magical treasures, and so on seemed perfect for Magic. And, in addition, I felt that mythos was unrepresented in the game market. I had oodles of Asian-themed games, but only a few based on the Arabian Nights. In addition, I had just read Ramadan (Sandman #50), which is set in the Arabian Nights mythos, so I took that as a sign. To prepare for this task I checked out about a dozen books on the Arabian Nights from the library. These included various translations, interpretations, and critiques of translations. I read several translations, jotting down all the major characters, creatures, items, and places I ran across. I took stabs as to whether these things should be white, blue, black, red, green, artifact, or land. This was not all that difficult, although it became clear early on that I wanted land to take on a far bigger role than mere mana production. Diamond Valley and Elephant Graveyard really felt like lands, and the feel of these places would be greatly enhanced if they did more than merely produce mana. Next, I distributed these names into the common and uncommon slots (there were no Arabian Nights rares). I did this roughly by putting the things that were part of the Arabian Nights atmosphere--often background elements but seldom main players--into the common pile. For example, asps, tortoises, and nomads appear in a lot of stories but aren't the subjects of the stories. The things that were major parts of stories, or associated with just a single story, went into the uncommon pile. For example, Drop of Honey and Repentant Blacksmith were both particular stories, and Sindbad was a major player in many stories. There were certainly cards that didn't fit into this scheme, but that procedure was the rule of thumb. The most notable exceptions were the djinni and the efreet, which were fairly common major players in the Arabian Nights, generally without specific names but with specific personalities. It seemed that these powerful, important players should not be common--or of one color--and so I put one of each in every color but white, where they did not seem to belong. A fundamental part of Magic is that all colors have particular strengths and weaknesses. If that had not been the case, choosing a color would simply be a flavor choice, like choosing a color in Sorry. Yet, to accurately reflect the Arabian Nights I felt I had to change the roles of the colors. Most notably, there was the more aggressive nature of what I would call "white" spells, as illustrated by Eye for an Eye, Jihad, and Army of Allah. 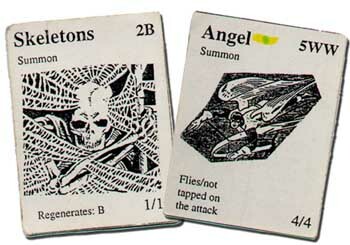 In The Gathering, Drudge Skeletons and Serra Angel were simply named "Skeletons" and "Angel" until quite late in the process. The more we thought about the future of the game--even if the sets were distinct and not played with each other--the more we thought we should have more specific names. So in the project's twilight we brainstormed more specific names for The Gathering cards. Richard's last-minute decision to give cards unique names -- like "Drudge"
and "Serra" -- paid off when Arabian Nights was created. The wisdom of this decision was driven home by Arabian Nights, where I had four Djinns and four Efreets that obviously needed to be distinguished from each other. I began with an Arabic-English vocabulary guide that was in one of my Arabian Nights reference books. I pulled out many words, such as "nafs," "juzam," and "erg," which roughly mean things like "hidden," "evil," and "desert," respectively. Those are not the actual translations (I can't find my reference to get that information) and looking online hasn't been much help. I suspect this is because the words are obscure and subject to several different spellings (e.g., djinn, djinni, jinn, jinni, genie, etc.). I distributed these words among my card names as needed. For the four pairs of Djinns and Efreets, I used two evil/corrupt - type words from this list for black ("juzam" and "junun"). I happened to be attending two weddings in the summer of '93, so I named the green Efreet and Djinn for my sister and her betrothed (Ifh-Bíff Efreet and Erhnam Djinn), and the red pair were named for the bride and groom in the other wedding (Ydwen Efreet and Mijae Djinn). The blue pair were both named, appropriately, after an island, which I believe is Ceylon (better known as Serendib). Shahrazad is my favorite card from this set because its effect is so interesting (if annoying) and illustrative of my favorite part of the Arabian Nights. Shahrazad was the storyteller of the Arabian Nights tale. She told the sultan a story each night, never finishing the story because that would mean her execution in the morning. Instead, she inserted stories in stories and always left him hanging so that he would keep her around to hear the rest of the tale. And, of course, all of the Arabian Nights is a story within her story. Hence, I chose to make this card a game within a game. When you play Shahrazad, you and your opponent suspend the current game and play a subgame with the remainder of your decks. The loser of the subgame halves his or her life. A few months after publication, it was pointed out that Shahrazad was potentially part of a hugely annoying and effective deck that included all plains (or better, Mox Pearls) and Shahrazads (in those days there were no deck-size or card-frequency limits). Maybe you play with eighty of them. Anyway, shortly into each game, Shahrazad is played, and you begin a subgame. Let's call the initial game G0, the first subgame G1, and so forth. This continues until your opponent is decked in, say, G7, from his inability to draw an opening hand. (Remember, your initial deck is at least twice the size of his.) Then in G6, his or her life is halved. Play another Shahrazad and begin a new game, call it G77. Again the opponent's life is halved from decking, and so forth. Then in G77777, which is lost once again due to decking, your opponent is finally reduced to 0 life. So you go back to G5, and soon begin G66. Anyway, after about 5^7 games, you will be victorious. I guess it says a lot about me that I think that is cool. City in a Bottle warrants special mention. City in a Bottle is drawn from Ramadan (Sandman #50). In Ramadan, the Arabian Nights mythos is captured in a bottle so it will live forever in dreams and stories. The story was told in the "story within a story" manner, and I found it quite moving. As I mentioned, I was worried that with the hurried development of Arabian Nights, the set would be broken or that people would just not want to play against it. I wanted to provide an answer, so, like the various Circles of Protection that held the colors in check, I decided to add an Arabian Nights hoser. I thought City in a Bottle was the ideal name for this card because you are bottling up your opponent's cards. It also seemed fitting that this was the one card with a decidedly modern reference--the Sandman comic book. As Arabian Nights' printing drew nigh, there was more and more agitation over the decision to give it a different card back. The players were giving feedback on the idea and by and large hated it. I weighed all of my logical reasons for wanting a different card back--primarily the collapse of the game into complexity and the strongarming of players into buying cards they might not want--against my gut feeling that they were right and there really should be only one card back. I was told by many that players could moderate the game themselves by using the Arabian Nights expansion symbol--something I considered but wasn't wild about because the symbol was so subtle. I remember at the last minute talking with Peter Adkison on the phone, with him telling me he would go with whatever I wanted. I decided to leave the card backs the same--and the future of Magic was set. Though I think the single card back was the correct way to go, the issues I worried about were real, and weren't solved until much later. The primary solution was the Standard format, which rotates out cards every two years. This keeps the complexity from growing too large, for both players and designers, and also eventually kills expansions that a player doesn't like for whatever reason. The need for this format was driven home after the Ice Age set was printed. But my dear listener, I see it is growing late, so that is a story that will have to wait for another time.